Effector T cells generated in the mesenteric lymph nodes (mLN) are known to accumulate in mLN and the tissue drained by them after circulating in the blood. Their accumulation is due less to preferential entry into mLN but more to preferential proliferation within mLN. The factors regulating the proliferation of effector T cells in vivo are unclear, and it is unknown whether they are different for CD4+ and CD8+ effector T cells. Rat T cells from mLN or peripheral lymph nodes (pLN) were stimulated polyclonally via the TCR and CD28 and injected i.v. into congenic recipients. 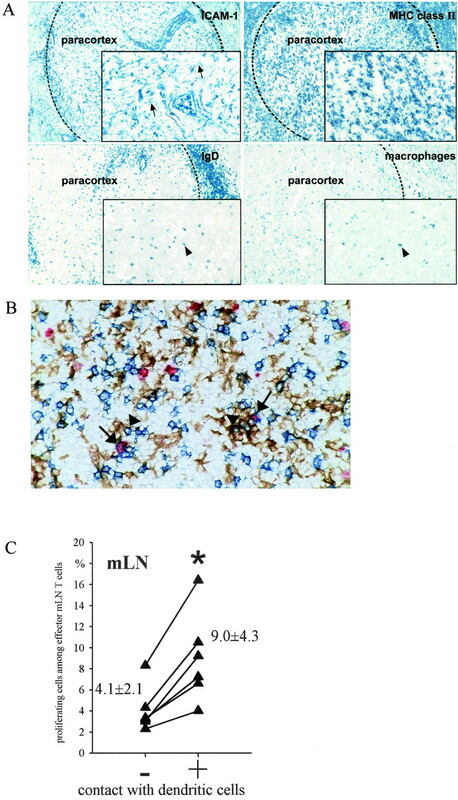 Using three-color flow cytometry and immunohistochemistry, they were identified in mLN, pLN, and blood over time, and proliferation was determined by measuring bromodeoxyuridine incorporation. Only effector mLN T cells showed a significantly increased proliferation rate after entry into mLN compared with that in pLN (2.4 ± 1.8% vs 0.8 ± 0.4%). Proliferation among the injected cells was higher when they had contact with dendritic cells within mLN (9.0 ± 4.3%) than when they did not (4.1 ± 2.1%). Furthermore, effector mLN T cells which were observed 56 days after injection maintained the capacity for preferential proliferation within mLN. Interestingly, CD4+ effector mLN T cells proliferated at a higher rate (4.8 ± 0.7%), remaining in mLN, whereas CD8+ effector mLN T cells proliferated at a lower rate (3.3 ± 1.0%) and were able to leave the mLN into the blood. Elucidating the factors regulating the proliferation of effector T cells in vivo will help to modify their distribution for therapeutic purposes. A key feature of the immune system is its ability to respond locally to invasive pathogens or translocated Ags. For example, during an intestinal immune reaction, Ags reach the mesenteric lymph nodes (mLN)3 via afferent lymphatic vessels (1). In mLN, the Ags are presented to T lymphocytes which then continuously circulate through secondary lymphoid organs. T lymphocytes which encounter Ag are stimulated and clonally expand within the tissue of their initial stimulation. It has long been known that T cells, which are stimulated within the mLN, leave the lymph node, circulate throughout the body and are preferentially found in mLN and the tissues drained by them such as Peyer’s patches (PP) (2, 3, 4). We recently stimulated rat T cells from mLN in vitro polyclonally via the TCR and CD28 and transferred these cells (RT.7B) i.v. into congenic rats (RT.7A), allowing the tracing of injected cells in vivo and avoiding the potentially harmful effect of in vitro labeling. In addition, the proliferative capacity of the injected effector T cells was analyzed in various organs by measuring bromodeoxyuridine (BrdU) incorporation. These studies showed that effector mLN T cells entered mLN, PP, and the small intestine at a similar rate. However, within these three sites, effector mLN T cells proliferated at a higher rate than those that had entered peripheral lymph nodes (pLN) (4, 5, 6), leading to the preferential accumulation of effector mLN T cells in mLN, PP, and lamina propria of the gut (4). Further in vitro studies showed that the cytokines TGFβ-1 and IL-4 are involved in the maintenance of the proliferative capacity among the effector mLN T cells (6). Since TGFβ-1 and IL-4 are preferentially expressed in mLN, PP, and gut (6), it is very likely that these cytokines are also involved in vivo in mediating the preferential proliferation of effector mLN T cells, resulting in their site-specific accumulation (7). However, many factors regulating the preferential proliferation of effector T cells are still unclear. Therefore, in the present study we analyzed where the capacity of preferential proliferation is imprinted on effector mLN T cells and up to which developmental stage of T cell life it lasts. Furthermore, dendritic cells (DC) in the T cell area of lymphoid organs activate naive T cells (8) and it was investigated whether they might be involved in the regulation of effector T cell proliferation. Finally, we studied whether and how CD4+ and CD8+ effector mLN T cells are different in their proliferative and migratory capacity. Such information is important to modify the distribution of effector T cells in vivo to therapeutically influence the course of many diseases (1, 9). Rats from the standard inbred strain LEW/Ztm (RT.7a) and the congenic strain LEW.7B/Won (RT.7b) were bred and maintained at the central animal laboratory of the Medical School of Hannover (Hannover, Germany). The LEW.7B strain is identical to the congenic strain originally designated LEW.Ly1.2 (10). The RT system is a diallelic polymorphism of the CD45 molecular system (11). Cell suspensions were prepared from LEW.7B mLN and pLN and stimulated via the αβ TCR and CD28 as previously described (4). To generate rested effector mLN T cells, effector mLN T cells were cultured for another 4 days in medium containing IL-2 (1/100 dilution, supernatant of cultured IL-2-transfected Chinese hamster ovary cells). Then 100–200 × 106 effector mLN and pLN T cells (LEW.7B) and rested effector mLN T cells were characterized by flow cytometry as described previously (4, 5) and injected i.v. into LEW rats over 2 min. They were sacrificed 1–3 days after injection. One hour before exsanguination, the recipients received 5 mg BrdU/100 g body weight i.v. (12). Injected cells were detected by the mAb His41 against the LEW.7B phenotype via flow cytometry (11). The percentage of BrdU+ cells among His41+CD4+ and His41+CD8+ T cells was analyzed by FACScan as described below. At least 5 × 104 viable injected cells were analyzed. About 2–2.5 × 108 LEW.7B mLN cells were stimulated via the αβ TCR (Ab R73) and CD28 (Ab JJ319) and cultured in the presence of 10 μM BrdU for 3 days as previously described (4). After expansion of stimulated cells, 2–2.5 × 108 stimulated BrdU+ mLN T cells were injected i.v. into LEW rats. At 1–4 days after injection, the recipients were exsanguinated, the blood, mLN, and axillary LN/cervical LN (pLN) were removed, and cell suspensions were prepared. After washing, the injected T lymphocytes were detected by the mAb His41 against the LEW.7B phenotype (11) and their BrdU content was identified via flow cytometry (6). At least 5 × 104 viable injected cells were analyzed. Cell suspensions from mLN and pLN were prepared and cells were stimulated via mAbs against the TCR and CD28. At 3 days after stimulation, cDNAs were synthesized from these effector mLN and pLN T lymphocytes as described elsewhere (6) and competitive PCR was performed using a synthetic DNA control fragment (CF) as an internal standard (13). The 613-bp CF contained rat-specific primers for multiple cytokines (TGFβ-1, IFN-γ, IL-2, IL-4, and IL-10 and for the housekeeping protein β-actin (6). The PCR products were separated electrophoretically and the intensity of the ethidium bromide fluorescence was measured with an electronic camera (6). The quantitative evaluation was based on the amplification of 10-fold dilutions of CF (1 pg to 0.01 fg) followed by measuring the fluorescence intensity of the respective amplicons. The proportions of the PCR products coamplified from sample cDNA and a defined CF concentration were analyzed, resulting in relative concentrations of cDNA with respect to the CF concentration. Injected effector T cells and DC in the mLN and pLN were detected via immunohistology (14). Briefly, effector mLN T cells were injected into congenic recipients. Three days after injection, the animals received BrdU i.v. One hour after BrdU administration, the mLN were removed. Cryostat sections were made. Injected T cells were identified with the mAbs His41 (11) and DC were detected via an anti-ICAM-1 Ab (1A29, IgG1; Serotec, Oxford, U.K.) and their morphology and localization in the paracortex determined via an immunohistological three-color staining and visualization with the peroxidase-anti-peroxidase/alkaline phosphatase-anti-alkaline phosphatase technique (4, 15). About 500-1000 His41+ T cells were counted microscopically and their contact with DC was calculated as a percentage. By revealing the BrdU incorporation among the injected His41+ T cells, which had contact with DC in the mLN, the percentage of proliferation among the injected effector mLN T cells in response to the contact with DC was demonstrated. We have recently shown that effector T cells generated in vitro from mLN have the phenotypic and functional properties of in vivo-generated effector mLN T cells (4, 5, 6). For example, after i.v. injection they enter mLN and pLN in comparable numbers, but preferentially accumulate in the former due to a higher proliferation rate in mLN as compared with pLN (Fig. 1⇓). Preferential proliferation of effector mLN T cells 3 and 56 days after injection. Effector mLN and rested effector mLN T cells and also effector pLN T cells were generated and injected into congenic recipients. After 3 and 56 days, the recipients received BrdU i.v., so that all cells in the S phase of the cell cycle at the time of application were labeled. Using flow cytometry, the congenic cells were identified and the BrdU incorporation was determined. Quantification of BrdU incorporation among the injected T cells after migration into mLN and pLN demonstrates that the property of preferential proliferation of effector mLN T cells in the mLN remained for a long time, although on a lower level. (∗, p < 0.05 in the Wilcoxon matched pairs signed rank test and Mann-Whitney U test). Effector pLN T cells did not show this preferential proliferation. To investigate whether the property of preferential proliferation is retained beyond the effector phase, effector mLN T cells were generated in vitro as described and were then rested in the presence of only IL-2 for another 4 days. In contrast to freshly generated effector T cells which are large proliferating cells, rested effector mLN T cells are small and the percentage of proliferating cells is <1%, comparable to the proliferation rate among naive T cells (Table I⇓). Interestingly, in contrast to naive T cells, rested effector T cells still express high levels of activation markers such as IL-2R, ICAM-1, α4 integrin, and MHC class II (Table I⇓). Furthermore, most of them are CD45RC negative (Table I⇓), indicating that after resting the surviving T cells acquire a memory phenotype (16). These cells were then injected into congenic recipients, and 3 days after injection the recipients received BrdU i.v. Since mLN and pLN were removed 1 h later, it was guaranteed that the cells present in the lymph nodes during that time incorporated BrdU. The injected T cells were identified and the percentage of BrdU+ cells among the injected T cells was determined by flow cytometry. Interestingly, comparable to effector mLN T cells, the injected T cells that had rested for 4 days also showed an increased proliferation rate in mLN compared with that in pLN, although on a lower level than that of effector mLN T cells (Fig. 1⇑). Surprisingly, when effector mLN T cells were injected and analyzed for their proliferation 56 days after injection, the same increased proliferative capacity was observed in the mLN. The level was comparable to rested effector T cells (Fig. 1⇑). Since naive mLN T cells had a comparable proliferation rate after entry into mLN and pLN (6), the present data indicate that the property of preferential proliferation is acquired during activation and then maintained on a lower level for a long time after the effector stage (>56 days after stimulation). To study whether the property of preferential proliferation is restricted to effector mLN T cells, effector T cells generated in vitro from pLN were injected. In contrast to effector mLN T cells, the percentage of proliferating cells among the effector pLN T cells in the mLN was similar to that in the pLN (Fig. 1⇑). The data show that preferential proliferation is only linked to mLN T cells. Although BrdU incorporation and activation marker expression (IL-2R, ICAM-1, MHC class II) were comparable between effector mLN and pLN T cells before injection (4), analysis of cytokine mRNA expression among them showed that the two populations considerably differed in the expression of IL-2, IFN-γ, IL-10, and TGFβ-1 mRNA (Fig. 2⇓), showing that effector mLN and pLN T cells have different cytokine profiles probably determining their function and their proliferative capacity in vivo. Differential expression of cytokine mRNA in effector pLN and mLN T cells. IL-2, IFN-γ, IL-4, IL-10, and TGFβ-1 mRNA expression was quantified among effector pLN and mLN T cells by competitive RT-PCR as described previously (6 ). The intensity of ethidium bromide fluorescence of each electrophoretically separated PCR product was measured by an electronic camera and the amount of the respective cDNA is expressed as a percentage of the coamplified CF as internal standard. 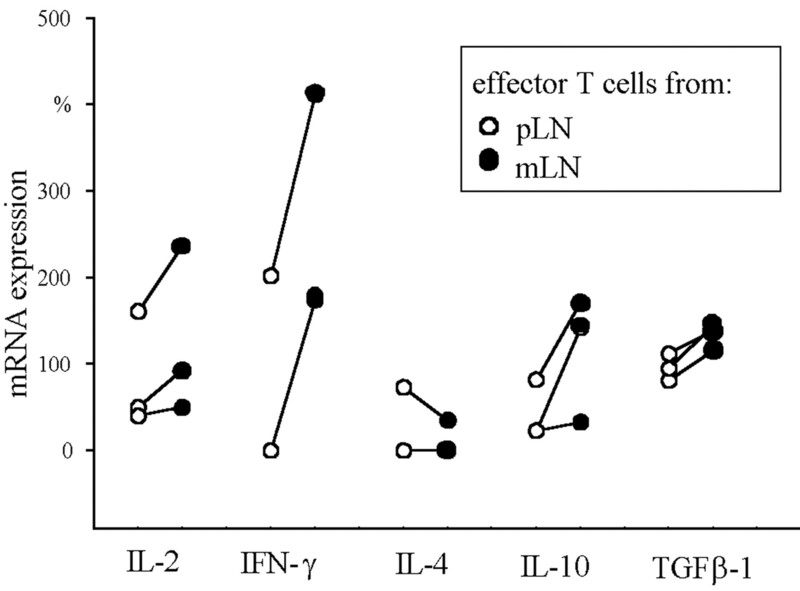 More IL-2, IFN-γ, IL-10, and TGFβ-1 are found among effector mLN T cells than among effector pLN T cells. The values obtained from the same animal are connected (○, pLN; •, mLN). DC are known to interact with naive, effector, and memory T cells, thereby regulating the quality of immune responses (17). To investigate whether DC are also involved in the regulation of the proliferative capacity among effector mLN T cells within mLN, effector mLN T cells were injected into congenic recipients. Three days later, the recipients received BrdU and 1 h later the mLN were removed. Cryostat sections were prepared, and DC, injected effector mLN, and incorporated BrdU were identified by three-color immunohistochemistry. Since ICAM-1 and MHC class II are highly expressed on DC, these two molecules were used to detect the DC. Both molecules are also expressed by B cells and macrophages in the secondary lymphoid organs. However, their expression of ICAM-1 is lower than on DC (Fig. 3⇓A). Therefore, DC were detected by ICAM-1 staining in the paracortex, which nicely shows the specific morphology of the DC. In addition, to rule out that macrophages or B cells were detected in the paracortex, B cells (anti-IgD) and macrophages (ED-1; Serotec) were stained and their morphology was compared with ICAM-1+ DC (Fig. 3⇓A). Contact of effector mLN T cells with DC leads to increased proliferation. A, Rat DC were identified via anti-ICAM-1 staining. Cryostat sections of mLN were stained immunohistologically with mAbs against ICAM-1, MHC class II, IgD, and macrophages (blue). Higher magnification (insets) shows that DC can be identified most effectively in the paracortex via ICAM-1 expression and their morphology (arrows). B cell and macrophage staining exclude negative evaluation of DC (arrowheads). B, Contact of effector mLN T cells with DC. Three days after injection of effector mLN T cells, recipients received BrdU, so that all cells in the S phase of the cell cycle at the time of application were labeled. DC were detected via an mAb against ICAM-1 (now brown!!) and injected effector mLN T cells were detected via the congenic marker His41 (blue, arrowheads). Injected effector mLN T cells, which proliferated and had contact with DC, were therefore seen in blue with a red nucleus (arrows). C, Quantification of proliferation among the injected effector mLN T cells that had contact with DC or not. First, it was analyzed which injected effector mLN T cells had contact with dendritic cells and which did not. Then proliferation was analyzed in these two cell populations (−, no contact; +, contact with DC, x-axis). The percentage of BrdU+ cells among the injected effector mLN T cells is indicated. The values obtained in the same animals are connected. The means are significantly different (∗, p < 0.05 in the Wilcoxon matched pairs signed rank test). Quantitative analysis showed that injected effector mLN T cells can be divided into two groups within mLN: one group that had contact with DC, and one group that had not (Fig. 3⇑B). By analyzing the proliferation rate in these two groups, it became clear that contact with DC enhanced proliferation of injected effector mLN T cells (Fig. 3⇑C). To analyze the proliferative capacity of CD4+ and CD8+ cells among effector mLN T cells after migration into mLN and pLN, effector mLN T cells (LEW.7B) were generated as described and injected into congenic recipients (LEW.7A). At various time points after injection, the animals received BrdU and 1 h later the injected T cells were identified by flow cytometry, and the percentage of BrdU+ cells among the injected CD4+ and CD8+ T cells was determined. After in vitro generation and directly before injection, the CD8+ effector T cells showed a significantly higher proliferation rate compared with that of CD4+ effector T cells (Fig. 4⇓). However, in mLN from 2 days after injection onward, CD4+ effector T cells proliferated to a higher degree than CD8+ effector T cells. Over 2 days the proliferation rate of both populations increased 2- to 3-fold in mLN, maintaining, however, a proliferative preference for CD4+ over CD8+ effector T cells. In pLN, the proliferation of CD4+ effector mLN T cells was comparable to that of CD8+ effector T cells 2–3 days after injection (Fig. 4⇓) and did not change over time. Thus, in contrast to pLN, the mLN microenvironment favors proliferation of injected effector mLN T cells, especially 3 days after injection, and among the effector mLN T cells CD4+ T cells proliferated two times more than CD8+ T cells. 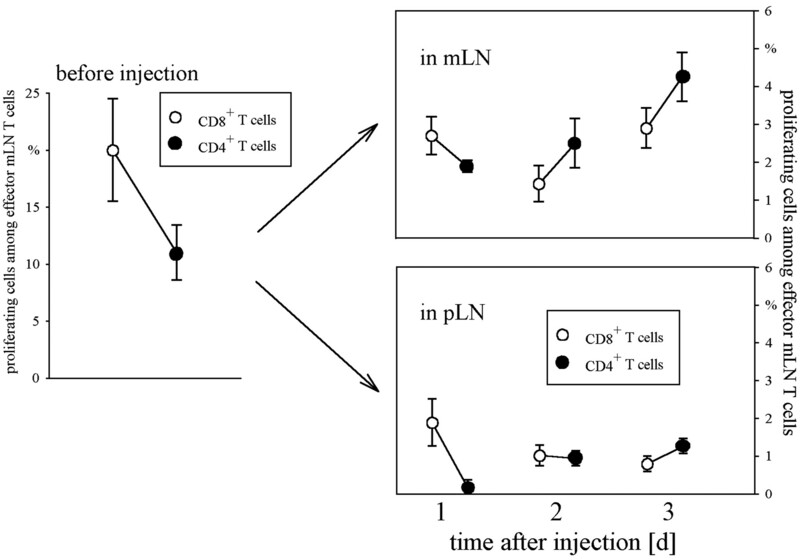 Different proliferation kinetics for CD4+ and CD8+ effector mLN T cells in mLN and pLN. Effector mLN T cells were generated and injected into congenic recipients. After 1–3 days, the recipients received BrdU i.v., so that all cells in the S phase of the cell cycle at the time of application were labeled. Using flow cytometry, the congenic cells were identified and both BrdU incorporation and the subset composition were determined. Quantification of BrdU incorporation among the injected effector mLN T cells after migration into mLN demonstrates that 2–3 days after injection the CD4+ effector mLN T cells proliferate at a significantly higher rate than CD8+. The percentage of BrdU+ cells among the injected mLN T cell subsets (CD4+, •; CD8+, ○) is indicated. Means and SEM are given from three to six independent experiments. Then it was investigated how the different proliferation properties of CD4+ and CD8+ effector mLN T cells affected their localization in mLN and pLN over time. Effector mLN T cells were generated as described. Since it is known that not all lymphocytes respond to such procedures (18), BrdU was given during the culture, which made it possible to follow in vivo only those cells which had been in the S phase at least once during in vitro activation. Then, we injected the BrdU+-labeled effector mLN T cells into the congenic rats and their distribution was analyzed in mLN, pLN, and blood. Although the percentages of CD4+ and CD8+ cells were comparable among the injected effector mLN T cells, CD4+ effector mLN T cells accumulated in the mLN over time (Fig. 5⇓A), correlating well with their proliferation pattern. In addition, the percentage of apoptotic cells among the CD4+ effector T cells was decreased compared with the CD8+ T cells 2–3 days after injection (percentage of apoptotic cells among CD4+: 11 ± 2.0%; CD8+: 16 ± 3.5%; mean and SEM, n = 4). Surprisingly, however, CD8+ effector mLN T cells preferentially accumulated in pLN (Fig. 5⇓B), although their apoptosis in pLN was comparable to that in the mLN (percentage of apoptosis among CD8+: 17 ± 2.5%; mean and SEM, n = 4) and their proliferation was not different from that of CD4+ cells (Fig. 4⇑). This indicates that the accumulation of CD4+ effector T cells in mLN might be due to three mechanisms: 1) preferential proliferation of CD4+ effector mLN T cells in mLN (Fig. 4⇑), 2) decreased apoptosis of CD4+ effector mLN T cells in mLN, and 3) preferential emigration of CD8+ effector mLN T cells from mLN. Indeed, 1 day after injection CD8+ effector mLN T cells were preferentially found in the spleen (CD8+, 56 ± 4.1%; CD4+, 44 ± 3.2%; n = 9–10) and from 2 days after injection onward in the blood (Fig. 5⇓C), indicating that the higher number of CD8+ effector mLN T cells in pLN is due to their higher availability in the blood and their subsequent migration into the spleen and pLN. Surprisingly, when adhesion molecule expression was measured among the CD4+ and CD8+ effector mLN T cells before injection and also 3 days after injection in the mLN, IL-2R, ICAM-1, α4 integrin, MHC class II, LFA-1, CD2, and L-selectin were not different among CD4+ and CD8+ effector mLN T cells (Table II⇓). This indicates that these molecules play a minor role in the different distribution of CD4+ and CD8+ effector mLN T cells in vivo. Effector T cells generated in mLN circulate in the blood and subsequently accumulate in their tissue of origin (mLN) and the tissue drained by them (lamina propria of the small intestine) (2, 4, 7). We have recently shown that this phenomenon is mainly mediated by preferential proliferation of effector mLN T cells within the microenvironment rather than due to preferential entry into these tissues. This preferential proliferation leads to an accumulation of effector mLN T cells at those sites where they are most needed (4, 5, 6, 19). The aim of the present study was to further identify factors which are involved in the regulation of effector T cell proliferation in vivo. The present study shows that the increased proliferation of effector mLN T cells after migration into mLN is also observed for effector mLN T cells, which were observed 56 days after injection, but not for naive mLN T cells (6). This indicates that the property to react with increased proliferation after migration is acquired during activation and is maintained, although on a lower level, even after returning to a resting stage. Since this was also observed 56 days after injection, it is likely that this property is imprinted on effector mLN T cells for a long time. However, it is not known at the moment whether it is lifelong or only for a certain period of time. Thus, effector mLN T cells and their progeny accumulate in regions where reinfection is likely and they are urgently needed. Interestingly, although both effector mLN and pLN T cells accumulate after migration throughout the body in their tissue of activation (4), only effector mLN T cells showed increased proliferation in mLN, whereas effector pLN T cells had a comparable proliferation rate in mLN and pLN (Fig. 1⇑). Recent data indicate that effector pLN T cells preferentially survive after migration into pLN, but undergo increased apoptosis in other tissues (e.g., mLN). This also results in preferential accumulation (4, 20) and shows that in vivo different mechanisms are responsible for the same observation. It is known that in mLN, TH2 cytokines prevail whereas in pLN TH1 cytokines dominate (6, 21), and recent data indicate that the different cytokine milieu present during activation is responsible for the proliferation properties of effector mLN and pLN T cells after entry into mLN and pLN, respectively (6). The present study clearly demonstrates that despite a comparable activation status and proliferative capacity after stimulation (4), effector T cells from mLN and pLN produce different cytokines (Fig. 2⇑), and further studies have to clarify whether the expression of cytokine receptors also differs between the two effector T cell populations. If a TH2 cytokine receptor pattern dominated among effector mLN T cells, this could explain their increased proliferation rate in mLN. The present study shows that effector mLN T cells in contact with DC proliferate approximately two times more than those cells that have no contact. Furthermore, it is known that IL-4 and TGFβ-1 mediate preferential proliferation of effector mLN T cells in vitro (6). Together this suggests that DC themselves produce these cytokines. Effector mLN T cells in contact with DC or in the immediate vicinity of DC would experience high levels of cytokines, resulting in higher proliferation rates, whereas effector mLN T cells further away would experience lower levels, resulting in a lower proliferation rate. However, this scenario does not exclude other sources of cytokines such as other lymphocytes, fibrocytes, and components of the extracellular matrix. DC, which are strategically located in the T cell area of lymphoid tissues (22), determine during activation of naive T cells the subsequent cytokine requirement of the resulting effector T cells, thereby strongly influencing their in vivo distribution. The cytokine pattern imprinted on the generated effector T cells seems to vary between mLN and pLN, and it is very likely that, in contrast to the polyclonal stimulation in vitro used in the present study, during Ag-triggered stimulation in vivo, the imprinted cytokine requirement is more specific, resulting in an even more focused accumulation of effector T cells at sites where they are needed. Since DC also seem to be relevant in providing naive T cells with either MHC class I or II molecules which they need for survival (7, 23), this clearly underlines the important role of DC both in maintaining the homeostasis of naive T cells and in generating effector T cells with characteristic accumulation properties during an immune response. Although both CD4+ and CD8+ effector T cells show a higher proliferation rate after migration into mLN compared with that after entry into pLN (Fig. 4⇑), the present study reveals major differences between the two subsets. After in vitro generation and before injection, the percentage of proliferating cells was about 2-fold higher among CD8+ effector mLN T cells than among CD4+ cells. However, this ratio reversed after entry into mLN beyond 2 days after injection in which CD4+ effector mLN T cells had a proliferation rate two times higher than the injected CD8+ T cells. This indicates that factors regulating effector mLN T cell proliferation are different for CD4+ and CD8+ cells, and that in vivo the microenvironment of mLN preferentially supports the former. The differential regulation of proliferation is characteristic for mLN since in pLN the two subsets proliferate at a comparable rate beyond 2 days after injection. The factors responsible for the differential proliferation of CD4+ and CD8+ effector T cells in mLN are completely unknown. In line with the increased proliferation rate of CD4+ effector T cells is their decreased apoptosis early after injection. Both the increased proliferation and the decreased apoptosis result in their increased survival and therefore in their increased accumulation in mLN over time (Fig. 5⇑). Surprisingly, however, CD8+ effector mLN T cells accumulated in pLN, although here both CD4+ and CD8+ effector mLN T cells proliferate at a comparable rate and apoptosis of CD8+ effector mLN T cells was not different from those CD8+ effector mLN T cells in the mLN. This shows that to identify the cause of lymphocyte accumulation in vivo, not only proliferation within a tissue but also entry, cell death, and exit have to be considered (7, 24). At present, we have no evidence that CD4+ and CD8+ effector mLN T cells differ regarding entry into the lymph nodes. This is underlined by the finding that CD4+ and CD8+ effector mLN T cells had comparable expression of adhesion molecules directly before injection and after migration in vivo. However, there seems to be a difference in exit from the tissue. From 2 days after injection onward, CD8+ effector T cells prevail in the blood. Therefore, more CD8+ than CD4+ effector mLN T cells are available for entering pLN, thus providing a likely explanation for the preferential accumulation of CD8+ effector mLN T cells in pLN, although no difference in the proliferation rate was seen between the two subsets within pLN. This conclusion is supported by the comparable kinetic pattern of CD4+ and CD8+ effector mLN T cells in blood and pLN (Fig. 5⇑). It suggests that, beside the preferential exit of effector CD8+ effector T cells from mLN, it is mainly the availability in the blood which determines the number of effector mLN T cells in pLN. Evidence was obtained recently that among the progeny of the effector mLN T cells dividing within mLN, preferentially the progeny of the CD8+ effector mLN T cells are able to leave the lymph node into the blood (5). Similar observations were made in HIV-infected primates in which activated CD4+ T cells seem to be more sessile, whereas activated CD8+ T cells are able to leave into the blood and migrate through the body (Ref. 25 and S. Sopper, personal communication). However, the different migratory properties of CD4+ and CD8+ effector mLN T cells have to be confirmed by injecting them i.v. and by monitoring their appearance in the thoracic duct after transmigration of the mLN (7). Thus, effector mLN T cells after entering mLN develop a proliferation rate that is significantly higher than that in pLN. CD4+ effector mLN T cells preferentially survive and remain in the mLN as has been also shown for effector/memory CD4+ T cells in the mouse model (22, 26) and correlates with their function to regulate the nature of the immune response within the tissue. In contrast, CD8+ effector mLN T cells are able to leave the mLN in considerable numbers, thereby supporting their function to screen the tissues of the body for infected cells. Many diseases are characterized by the accumulation of effector T cells in the affected tissue. For example, in inflammatory bowel disease accumulations of effector CD4+ T cells are found in the lamina propria of the diseased part of the intestine (1). Our study indicates that by altering the cytokine milieu in the affected tissue, the survival of the harmful effector CD4+ T cells might be modulated in a beneficial way. In addition, by modifying the exit of autoreactive CD8+ effector T cells from the lymph node unwanted immune reactions, such as destruction of the pancreatic islets, might be preventable (27). The donations of the congenic rat strain by Dr. K. Wonigeit (Transplantations Labor, Medizinische Hochschule Hannover, Hannover, Germany), and the mAb JJ319 by Dr. T. Hünig (Institut für Virologie und Immunbiologie, Universität Würzburg, Würzburg, Germany) are gratefully acknowledged. The comments of Drs. B. Lüttig, R. Pabst, and T. Tschernig (Anatomie II, Medizinische Hochschule Hannover, Hannover, Germany) have been of great help. We thank K. Bankes and I. Dressendörfer for excellent technical assistance and S. Fryk for the correction of the English. ↵1 This study was supported by the Deutsche Forschungsgemeinschaft (SFB 244, A7 and Graduiertenkolleg “Charakterisierung von regulatorischen Peptiden und ihrer Zielproteine”). ↵3 Abbreviations used in this paper: mLN, mesenteric lymph node; pLN, peripheral LN; DC, dendritic cell; PP, Peyer’s patches; BrdU, bromodeoxyuridine; CF, control fragment.